Earlobes can be stretched intentionally or unintentionally. 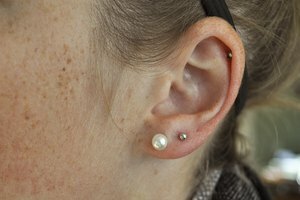 Some people choose to stretch their earlobes through the use of large-gauge earrings, creating large holes in the lobes. Other people find that years of wearing heavy earrings results in stretched earlobes. You can repair stretched earlobes, but extreme stretching will require medical intervention to correct. Stop wearing heavy earrings. Give your earlobes a break for a few months. If the damage is fairly new, they should repair themselves. Remove large-gauge or stretching earrings if you have them. Earlobes with smaller-gauge earrings, generally 2-gauge or less, often shrink on their own. If you had larger-gauge earrings, you may need ear-repair surgery to repair the stretched lobes. Avoid wearing earrings to sleep. When you move in your sleep, earrings can catch on things and pull slightly. 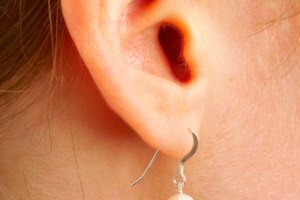 While you might not feel any pain, the movement may be stretching your earlobes. Consult a plastic surgeon regarding ear-repair surgery. 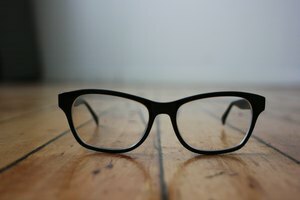 Most plastic surgeons refer to such procedures as split, torn or stretched ear repair surgery. Schedule an ear repair surgery. This is a short procedure, usually just 15 minutes. The doctor will apply a local anesthetic to your earlobes to numb them, then cut the lobe and sew it back together. This repair surgery usually removes the piercing hole from your ear. You can have your ears pierced again once the lobes have fully healed. Care for your earlobes properly following the repair surgery. Wash the lobes with water and soap three times a day to avoid infection. If your doctor instructs, apply a light layer of antibiotic ointment to the earlobes. If you wish to have your ears pierced again after surgery, talk to your doctor about it. Ask if he or she pierces ears. Doctors often pierce ears in the safest way possible, decreasing the likelihood of torn or split earlobes. Avoid wearing large, heavy earrings that dangle. After ear-repair surgery, it's best to stick to lightweight earrings.